Before revealing the details of this championship, we would like to announce two good news. First, Akela is coming back! Yes, she is feeling much better nowadays and is ready to step on the mats again. The second good news is that Zoe – a new promising session wrestler from Plzen, Czech Republic, that emerged recently on wb270, – agreed to work with Fight Pulse. Both Zoe and Akela are going to take part in our first mini-event, a bracket based championship between four lightweight wrestlers, alongside Katniss and Revana, that will take place on 11th of November, 2015, two weeks after this post is published. 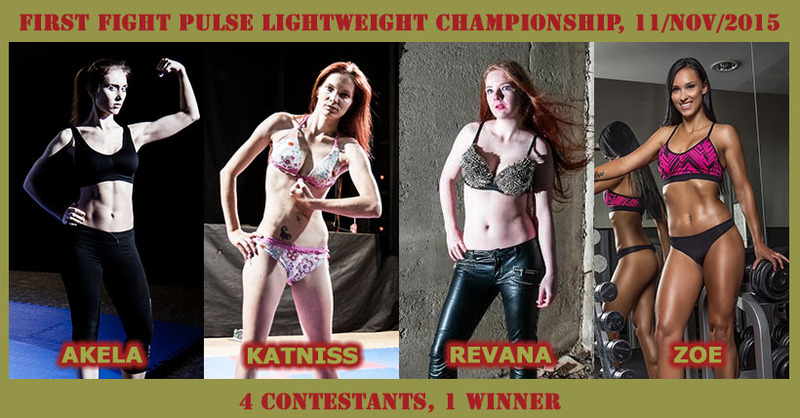 Out of four contestants one will emerge as the winner and receive the title of Fight Pulse Lightweight Champion, along with a complementary gift. NOTE: The championship has already been completed and the matches have all been released – FW-19, FW-20 and the final match (spoiler alert), FW-21. Please keep in mind that there is a limited amount of matches that we are going to film during the shoot after the championship, hence we will accept only first 3 sponsorship offers. And now, please take a moment to vote in the poll to predict the winners of the two elimination matches, as well as the first Fight Pulse lightweight champion. Who will win the first elimination match: Akela vs Katniss? Who will win the second elimination match: Revana vs Zoe? Who will become the first Fight Pulse Lightweight Champion? If you are not subscribed to Fight Pulse yet, you can do so through the form on the right sidebar. Subscribers get automatic notifications via email about new releases, as well as site updates – blog posts such as this one. Being a subscriber you will not miss a thing related to Fight Pulse. NOTE: in the wake of this championship we have introduced three basic weight divisions for future reference – lightweight (50 to 65 kg), middleweight (65 to 80 kg) and heavyweight (80 kg and above). Every wrestler has been assigned to a weight class, as can be read on their updated profile pages.